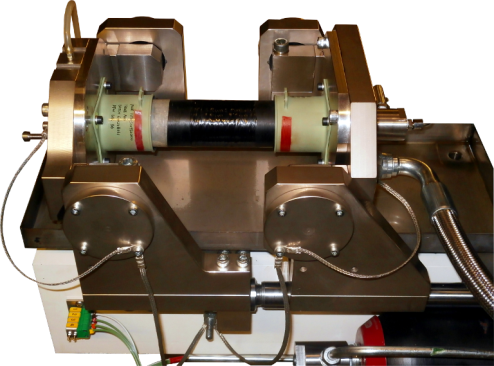 This apparatus was designed specifically for testing the seal and seal grooves used in aircraft fuel pipes. Fuel pipes on aircraft have to accommodate the moment of the fuselage and wings flexing during take off and landing and during turbulence in flight. 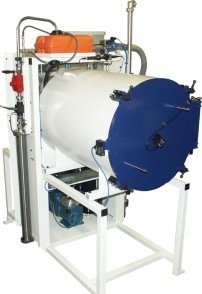 The test rig was built to enable endurance testing of the seal and seal grove geometry of metal and carbon fibre pipes in simulated flight. To achieve this the test parts had to contain pressurised A1 jet fuel at a constant pressure while the joints were cycled back and forth by up to ±9mm and tilted up and down by up to ±2°. During the endurance testing and to simulate flight conditions, the environment within the test rig was cycled in temperature from -55°C to +85°C, depressurised to the equivalent of 40,000ft and pressurised to 200ft below sea level. The control system enabled programmable heating and cooling rates and pressure conditioning to simulate accent and decent atmospheric changes. Due to the presence of fuel all components and systems used in the rig had to be ATEX rated. To further reduce the fire and explosion risk the altitude chamber was purged with pure nitrogen gas. The Si-Plan digital controller and data acquisition system and Test Control software running the Block Program package was used for rig control and data capture. Controlled cooling was via liquid nitrogen and associated control systems, while heating involved hot oil and a force blown heat exchanger to ensure surface temperatures were below the flash point of the fuel. Tooling enabled fuel pipes from 0.5” to 5.0” to be tested.